﻿ Best Price on Mahogany Hotel Residence & Spa in Gosier + Reviews! Mahogany Hotel Residence & Spa, part of Creole Beach Hotel, is set in tropical gardens on Guadelupe’s Verdure Peninsula. It offers a gym, spa and sauna, as well as an outdoor pool. 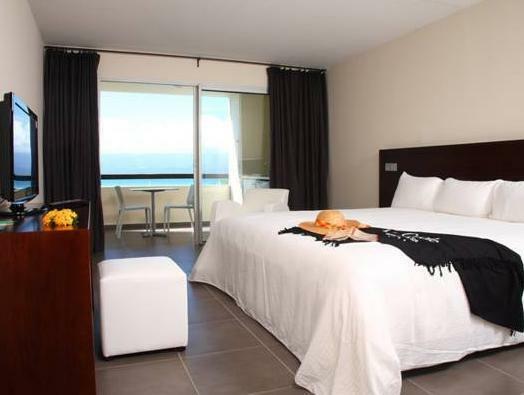 Air-conditioned rooms feature a furnished terrace, some with sea views. There is a safe and flat-screen cable TV. The private bathroom comes with a shower and hairdryer. There is a kitchenette with a fridge, microwave and coffee maker. The complex offers 2 restaurants serving Creole and international cuisine. You can enjoy breakfast on the poolside terrace overlooking the sea. There is a cocktail bar and a beachfront snack bar. Lots of water sports are on offer, and sea scooter trips can be arranged to discover the islands. The hotel offers 24-hour reception and free parking. Please note that meals are not included for children and cost EUR 10 for breakfast, EUR 13 for lunch and EUR 15.50 for dinner. Please note that WiFi costs EUR 5 for a 3-hour pass. First off the Mahogany is part of the Creole beach Spa setup, it is quite difficult to find initially as you have to use the Creole Beach reception. The rooms were clean and well serviced, maid service was everyday but timings were erratic, sometimes as late as 1800hrs partly due to (we think) insufficient numbers of staff. The grounds and facilities were well kept and catered for most tastes. A down side to our stay was the loss of any hot water for 3 days without explanation or apology, when we asked about the problem we were met with an indifference not normally associated with a purported 4 star hotel. The Zawag restaurant is superb and well worth a visit, we did not find the buffet style of the "Les Epices" restaurant to our taste and ate out most nights. Overall the Creole resort and Spa offers good accommodation but at a premium price, we felt that it lacked atmosphere and there never seemed to be enough staff at busier times, we are still a little baffled as to why the Mahogany is classed as a separate Hotel when it is quite clearly a residential block amongst several others in the Creole Complex, would we stay here again, Possibly rather than probably.